An orthodontic palatal expander is a commonly used appliance here at York Orthodontics. The expander can be used effectively to treat cases such as a crossbite, crowding or asymmetric jaw growth. Many adolescents have narrow jaws, causing a crossbite to form. A crossbite appears when the lower back teeth are biting outside the upper teeth. In most cases, there is also not enough room for the upper permanent teeth to emerge into proper alignment. This causes crowding. The most common form of treatment for these types of cases is a palatal expander. The expanders job is to create more space in the patient’s upper jaw. The recommended age for correcting these types of orthodontic problems is between the ages of 7-11. The upper left and right jaw are joined by a section of cartilage, which does not compete fusion until after puberty. Therefore, the width of the palate can still be increased. A palatal expander works by stretching and separating the bone and cartilage of the palate. This creates a widened position of the upper jaw, allowing more bone to grow in between. This can also create more space for teeth to shift into their desired alignment. Orthodontic expansion is traditionally accomplished by attaching a small, custom made appliance to each of the back molars. Small metal rings will be placed on the left and right back molars. The rings will be secured in place and met in the middle by an expansion screw. The screw must be turned in order to activate the expander. Once the key is turned, it will apply gradual outward pressure on the upper jaw. The pressure will stimulate the guided growth of the palate. The measured growth of the patient’s palate will take place over the course of several weeks or months, depending on the severity of the patient’s case. Once the palatal expander is cemented by Dr. Mir, he will provide the patient and patient’s parents with instructions on how to activate the expander. The patient will be provided with a key. This key initiates the gradual outward force, causing the patient’s palate to expand. His instructions will also include how often the key needs to be turned, as well as what to do in case the expander becomes loose or falls out. Although the palatal expander is designed to produce minimal irritation, it is common for the patient to experience some slight discomfort. This discomfort is usually occurs when the patient first receives the appliance. This is common, considering the patient is trying to adjust to a foreign sensation in their mouth. Excess saliva, trouble eating and speaking is to be expected. As well as experiencing pressure once the key is turned. This pressure is most commonly targeted at the patient’s teeth and roof of their mouth. It will take some time for the expander to feel natural in the patient’s mouth. Until then, Dr. Mir recommends serving food that do not require much chewing. At York Orthodontics, we also encourage patients with an expander to avoid candy or any sticky foods that are likely to get stuck against the expander. 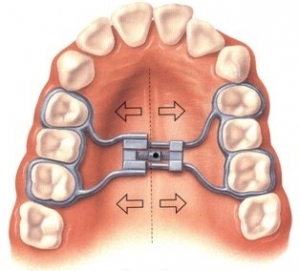 Once orthodontic expansion is accomplished, the expander will be permanently removed and the patient will move forward with their discussed treatment plan. It takes a skilled and educated orthodontist to detect an orthodontic problem like this and to determine where and when to place the expander. This is why we urge you to visit York Orthodontics if you or your child is experiencing any of the symptoms listed above.